The Kansas City Regional Training Academy introduces CrossFit to a class of recruits, and James Keller says he saw fewer injuries and improved performance. Located at the Kansas City Regional Training Academy in Kansas City, Mo., KCPD CrossFit has a mission to use CrossFit’s foundations and principles to enhance the functional fitness and quality of life of our members and to help them be better prepared to handle the physical demands of being a police officer. I have been assigned to the regional training academy for five years, working as a physical-training/defensive-tactics instructor for the last four. We consistently have up to two academy recruit classes training at one time. Recruit classes can range from single digits to upward of 60 people. Our applicant pool is diverse, ranging in age from 21 to fiftysomething. Physically, these recruits can range from collegiate athletes with formal training to sedentary people who have had little to no physical training. 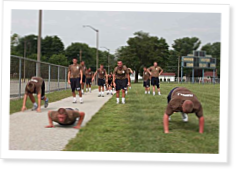 To determine their fitness level, recruits are given a physical evaluation within the first week. The evaluation is the traditional law-enforcement test: push-ups, sit-ups and a 1.5-mile run. Like most, our academy is no stranger to injuries during physical training. Depending on the seriousness, these injuries have at times resulted in the dismissal of the recruit, recycling to another class or lost time. CrossFit has helped to change that. Russell Berger explains how a company called 9Line works to support wounded warriors in their fight to recover from injury. Capt. Davitt Broderick believes implementing CrossFit at the company level can produce fitter soldiers. Here’s how to do it. Great artilce. We have used CrossFit since 2008 with our State Police recuit academy and since implementing CrossFit our injury rates have dropped to near zero with injuries coming mainly from combative training. CrossFit has also increase the recruits physical abilities on their exit PT scoring compared to previous years without using CrossFit.